On Wednesday, November 16, 2016, the Children's Defense Fund (CDF) will host its 26th Beat the Odds Celebration at the Newseum in Washington, DC. 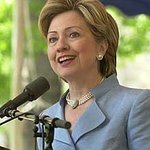 At the event, CDF will honor Children’s Defense Fund Alumna Hillary Rodham Clinton for her dedication and contributions to child advocacy and the Children’s Defense Fund throughout her remarkable career. The event will highlight the stories of five extraordinary high school seniors who have overcome tremendous adversity to excel academically and give back to their communities. Each will receive a $10,000 scholarship, an invitation to join the Children’s Defense Fund’s youth leadership development programs, guidance through the college admissions process and a laptop computer. To learn more about the 2016 scholars, see their short bios. Programming begins at: 8:00 p.m. The Children’s Defense Fund Leave No Child Behind mission is to ensure every child a Healthy Start, a Head Start, a Fair Start, a Safe Start and a Moral Start in life and successful passage to adulthood with the help of caring families and communities.